The material used to construct these hinge and post systems is also unique and delivers a myriad of benefits, from impressive durability to features that support the tenets of sustainable design and green building. The new hinge and post toilet compartment is made from HDPE, which is one of the most commonly used plastics in the United States. It is found in milk jugs, plastic bags, and yogurt cups. Technically speaking, when polymer resins are compounded under high pressure and form a single thickness panel, the result is referred to as solid HDPE. Solid HDPE is the material used to fabricate the hinge and post bathroom doors and partitions. This material is also used to create lockers, shower stalls, and playground equipment. 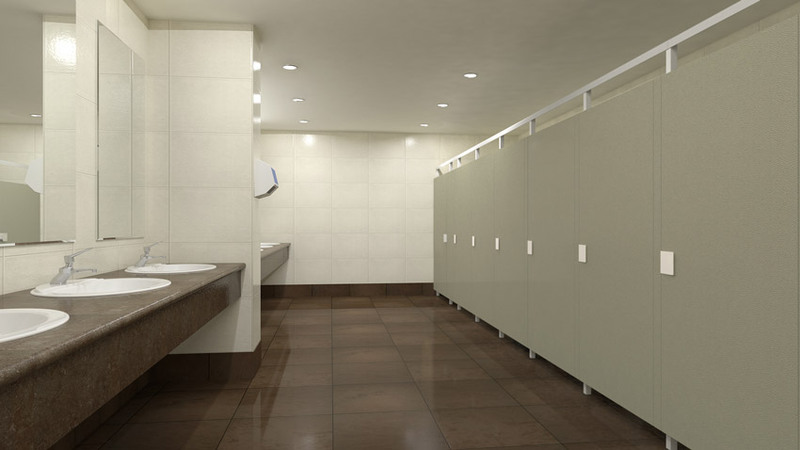 Commercial bathrooms can be harsh and high-traffic environments that are often damp, making the materials used in these environments susceptible to mold, mildew, and rust. Vandalism and graffiti are also common occurrences in these public yet private spaces. HDPE is naturally resistant to all of these potential threats, making it a material that is uniquely suited to overcome the typical challenges faced in the bathroom application. HDPE hinge and post bathroom compartments can be specified in colors and textures that resemble popular building materials, such as stainless steel, without the risk of rust or incurring the sizable maintenance costs often associated with these finishes. Hinge and post bathroom enclosures made from HDPE are uniquely suited to face the typical challenges of the bathroom environment because they do not support the growth of mold or mildew, resist marks made by pens, pencils, and markers, and have a greater resistance to dents than traditional metal materials. HDPE panels are waterproof and nonabsorbent. The solid plastic’s nonporous and impermeable surface does not support the growth of mold, mildew, or rust. In addition, these plastic partitions are naturally resistant to common bacteria, including methicillin-resistant staphylococcus aureus (MRSA), an infection caused by a type of staph bacteria that’s become resistant to many of the antibiotics used to treat ordinary staph infections. Testing has shown that after 24 hours, 98.4 percent of MRSA bacteria placed on the surface of an HDPE panel died without the use of cleaning solutions or antimicrobial additives. These solid plastic partitions are resistant to marks by pens, pencils, markers, and other writing instruments. Graffiti can be easily wiped away from the surface of an HDPE panel with a common, nonabrasive cleaner. HDPE panels have a greater resistance to impacts and dents than traditional metal materials. An impact test conducted in accordance with an ASTM International standard revealed that HDPE panels have a resistance to impact that is 59 times greater than the tested metal surfaces. Solid HDPE material is a solid piece of plastic that is uniformly colored throughout with a pigment that is blended during the extrusion process. The color is physically integrated into the material, not added on top of it at a later stage as a coating or laminate. This means that an HDPE hinge and post bathroom panel will never delaminate or require painting to maintain the appearance of the system. HDPE toilet compartments also support the goals of sustainable design in many ways. 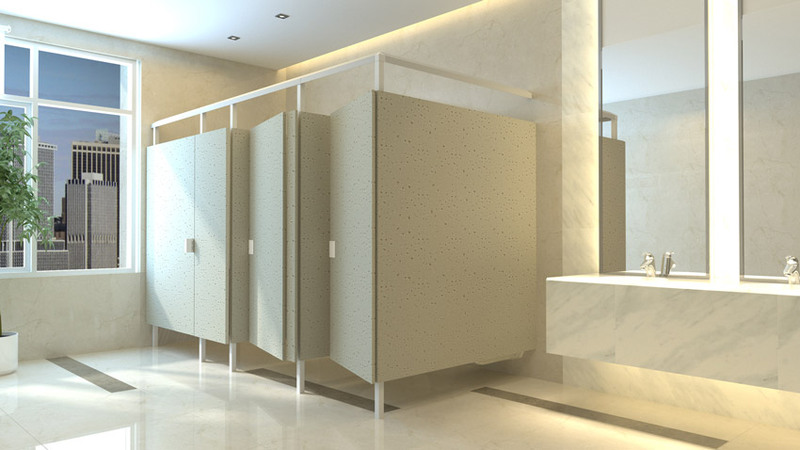 These systems are designed to reduce the environmental impact of a project and offer initial and long-term improvements to the indoor air quality of the commercial bathroom space. HDPE partitions are fully recyclable, can contain a significant amount of recycled content, and are recognized as low-emitting products that protect the quality of the interior environment throughout the life of the bathroom system. The HDPE toilet compartment is fully recyclable, can contain a significant amount of recycled content, and is recognized as a low-emitting product. A recyclable product can be remanufactured back into the original product or something else rather than heading for a landfill after its first useful life has ended. HDPE is easily recyclable and can be used again and again. Moreover, recycled HDPE creates no harmful emissions during its production or throughout the duration of its subsequent useful lives. Beyond being fully recyclable, an HDPE hinge and post toilet compartment can contain products that were recycled, which is also referred to as being a recycled-content product. This means that the HDPE bathroom enclosure contains items that have been diverted from the traditional waste stream, allowing used items to be reused as part of an HDPE bathroom solution instead of taking up space in a landfill. The amount of recycled material in a product is typically stated as a percentage. A higher percentage indicates that more of the total product was created from recycled content. 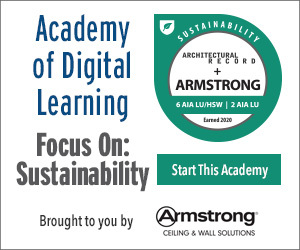 New trends in green building and sustainable design programs are placing a growing emphasis on identifying the stage of use at which the product was sent to become recycled content. Most commonly, recycled content is categorized as either post-consumer recycled content or post-industrial recycled content. Post-consumer material is defined as waste material that has been used by a consumer, disposed of, and diverted from landfills. It does not include waste generated during the manufacture and fabrication of a product. Hinge and post bathroom partitions made from HDPE can be specified and manufactured to contain up to 100 percent post-consumer recycled material. This is significantly higher than the average recycled content found in traditional bathroom partition products. There are two terms, often used interchangeably, that refer to material that is being recycled from waste produced during the manufacturing process. The two terms are post-industrial and pre-consumer. In either case, it refers to a material that essentially became waste during the manufacturing process of another product and, as such, was never used in an end-user capacity. HDPE bathroom doors and divider panels typically contain between 25 percent and 75 percent of post-industrial recycled content. This is, again, significantly higher than the post-industrial recycled content found in the metal partitions often used in the pilaster-based bathroom systems. Another aspect of the HDPE material that supports sustainable design objectives is its zero-VOC emissions rating. This low emission quality is due, in large part, to the fact that the HDPE partitions are manufactured from a solid plastic material that physically integrates the desired pigment throughout the material during the fabrication process. The hinge and post panels do not employ paints, coatings, adhesives, or sealants of any kind. The solid HDPE partitions do not emit or off-gas any VOCs over the course of their usable life.